It’s 8:20am. I’ve spilled scalding hot coffee on my hand (as I do every morning) while I open the door to ENACT’s headquarters in Manhattan. I head over to my desk and on it there is a list of the day’s tasks. But I already know that within minutes of opening my email and checking my voicemail, I’ll throw it out and write another one. In any event, it’s time to get things moving so that all 65 of our current programs can run smoothly. This means monitoring our 49 Teaching Artists and remaining available to pick up a call from them as they teach, calling schools, creating program designs and budgets, answering questions for the Department of Education, and looking for new sources of funding for our programs. By the time I take another sip of coffee, it’s gone cold. At least it won’t burn my hand again. I’m the Program Manager at ENACT, and I’m just one part of a very small administrative team. Seriously, there are only five of us. However, stepping into our office is like jumping on a high speed train, and it’s all of our responsibility to keep it moving forward and make sure we don’t crash. At any given moment, we have our minds in a million-and-one different places, and juggling just as many tasks. Through our efforts, the ENACT train keeps on chugging along, without crashing, and few notice the crew in the conductor’s cab working furiously to make that so. Our days are high pressure and nonstop. But I speak for all five of us when I say there isn’t a day when we aren’t full of appreciation and a sense of privilege for being a part of this organization. A year ago, that wasn’t the case for me. I was working a job at a completely different type of organization, an organization focused on product and marketing instead of human interaction and value. I dreaded going to the office. I complained all the time, and if I’m honest, I went to more happy hours than I should have. That’s when I had a ‘eureka’ moment: I’m happiest when all the efforts I make can help people directly, and I’m unhappy when I can’t. In a bold (and perhaps financially unsound) move, I quit and spent a long time searching for the place I could serve people and feel fulfilled in my work. 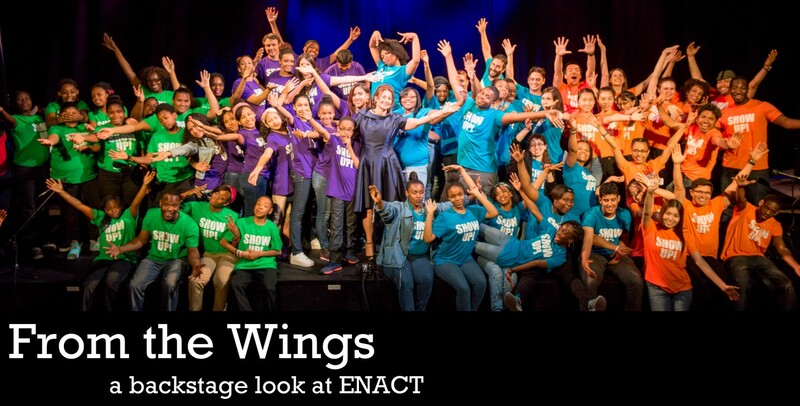 This is the moment where I discovered ENACT — a people-centered organization that focuses on developing the social and emotional capacities of youth in New York City. And, not just any youth, but those kids everyone thinks are trouble, those kids that become statistics. At ENACT, each of our programs are unique and customized to the needs of the students and schools in which we are working. This year in particular, our method of individualizing student workshops to the needs of the school was crucial as we received a unique opportunity to work with high school students who are also in the correctional system. We realized we would be teaching kids that have faced more struggles and more adult situations than most. These students would most likely be emotionally guarded and resistant to our work because of the defenses they have created in order to survive. A few weeks after the program started, one of the Teaching Artists at that site came into our office to drop off some paperwork. I asked her how the program was running, expecting to talk about the numerous challenges that site had. Instead, we had a wonderful conversation about one particular student. This student would be in the correctional facility for some time due to the charges against them and had originally showed no interest in participating in the groups. However, after a few workshops, he opened up in front of the group about the actions that led him to the correctional system and, more importantly, how ENACT was going to help him get through the remainder of his time there. Until that point, I had been particularly frustrated with the pressure of starting a new program, the task of interfacing with a new administration, and the inherent bureaucracy in any educational system. But this conversation made those concerns melt away. While the challenges persisted, I was able to face them with a renewed sense of vigor since I had been reminded that it was all worthwhile. The students were receiving a community of care and ENACT was a large piece of that complicated puzzle. I realized through that conversation the part I played in helping these kids. I don’t get to see them every day, but the work I do impacts the work they do. One of ENACT’s core values is “To work toward our highest potential”. We ask our kids to embrace these core values as well. I realized that when I am working toward my highest potential in the office, I am enabling our Teaching Artists to work toward theirs, which in turn allows our students to search for and achieve their highest potential. How many people can say that about their job? In ENACT, I found an organization that keeps at its core the unity of the team. Before we can do anything, the ENACT team ensures that we’re united behind our goals. In fact, it’s the only way to keep the train from derailing! This unity is where all of our awesome work starts and where it all returns. I would go so far as to say that our small office team of five is the true definition of “Teamwork Makes the Dreamwork”. While some other folks might look at our work: emails, phone calls, contracts, meetings, scheduling… and say “Ugh, I guess I have to do this,” the five of us say “Yes! We get to do this!” Because we know it makes the work possible. Go team! Clara serves as the Program Manager at ENACT. In her spare time, she studies philosophy, walks her dog, and tries to get her friends to do karaoke with her. She can also be found traveling to Philadelphia because she is a Philly native “in her heart.” She hopes to stay with ENACT for years to come. This entry was posted in Office Team, Uncategorized and tagged communication, connection, core values, programs, teamwork. Bookmark the permalink.